Handbook of the Biology of Aging, Seventh Edition, reviews and synthesizes recent findings and discoveries in the field. 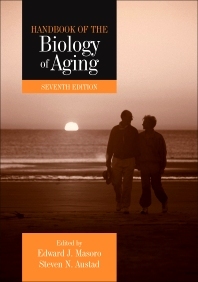 This volume is part of The Handbooks of Aging series, which also includes The Handbook of the Psychology of Aging and The Handbook of Aging and the Social Sciences. The book is organized into two parts. Part 1 covers basic aging processes. It covers concepts relevant to clinical research, such as muscle, adipose tissue, and stem cells. It discusses research on how dietary restriction can slow down the aging process and extend life in a wide range of species. Part 2 deals with the medical physiology of aging. It contains several chapters on the aging of the human brain. These chapters deal not only with diseases but also with normal aging changes to cerebral vasculature and myelination as well as the clinical implications of those changes. Additional chapters cover how aging affects central features of human health such as insulin secretion, pulmonary and cardiac function, and the ability to maintain body weight and body temperature. The volume is primarily directed at basic researchers who wish to keep abreast of new research outside their own subdiscipline. It will also be useful to medical, behavioral, and social gerontologists who want to learn about the discoveries of basic scientists and clinicians. Covers hot areas of research, like stem cells, integrated with longstanding areas of interest in aging like telomeres, mitochondrial function, etc. Researchers in gerontology, developmental psychology, social psychology, and sociology. Edward J. Masoro was the recipient of the 1989 Allied-Signal Achievement Award in Aging Research. In 1990, he received the Geriatric Leadership Academic Award from the National Institute on Aging and the Robert W. Kleemeier Award from the Gerontological Society of America. In 1991, he received a medal of honor from the University of Pisa for Achievements in Gerontology. In 1993, Dr. Masoro received the Distinguished Service Award from the Association of Chairmen of Departments of Physiology. He received the 1995 Irving Wright Award of Distinction of the American Federation for Aging Research and the 1995 Glenn Foundation Award. He served as the President of the Gerontological Society of America from 1994–1995, as the Chairman of the Aging Review Committee of the National Institute on Aging (NIA), and as Chairman of the Board of Scientific Counselors of the NIA. Dr. Masoro received his Ph.D. from the University of California at Berkeley. He has held faculty positions at Queens University (Canada), Tufts University School of Medicine, University of Washington,and Medical College of Pennsylvania. From 1973 through May 1991, he served as Chairman of the Department of Physiology at the University of Texas Health Science Center at San Antonio. He presently continues his duties as Professor in the Department of Physiology and is the Director of the newly created Aging Research and Education Center. On April 1, 1996, he became Professor Emeritus. Dr. Masoro was a Wellcome Visiting Professor in Basic Medical Sciences for the 1992–1993 Academic Year. His research has been in lipid metabolism, cold exposure, membrane biochemistry, and biological gerontology. Since 1975, Dr. Masoros research has focused on the influence of food restriction on aging. He has or is serving in an editorial role for ten journals, and in January 1992, he became the Editor of the Journal of Gerontology: Biological Sciences.